VA Home Loans MD | Alliance Mortgage Funding, Inc. I truly appreciate your visit today to my VA Home Loan site. I would be honored to help you with any questions you may have about purchasing a home, questions about the VA Home Loan program, or questions about how to refinance your present home. 3. Tired of just being a number? Get the personal service you deserve. Don't deal with an Internet lender who may be out of state, and out of touch. You can come to my office and meet with me or a member of my team personally, or you call me direct at 410-683-1500. 4. We understand Veteran's issues and situations. 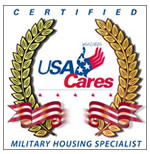 Each member of The Mandis Team at Alliance Mortgage Funding is proud to be a Certified Military Housing Specialist®, trained to better serve the needs of our honored Veterans. 5. You have earned the right to use this program! The VA mortgage is probably the single best mortgage program available today. 6. It doesn't cost you any more to work with the best local mortgage company in the business, and the best is The Mandis Team at Alliance Mortgage Funding. BUT, don't take my word for it. See for yourself. Google 'Alliance Mortgage Funding reviews' and then do a 'reviews' search of any other mortgage company you are considering. See for yourself what actual borrowers have to say about their mortgage experience, and make your decision from there. Alliance Mortgage Funding, Inc. has achieved the rare distinction of becoming nationally certified to work with and understand the uniqueness of mortgage lending to military borrowers after graduating from the Certified Military Housing Specialist Course, which is exclusively offered by USA Cares, Inc., a national military assistance non-profit that gives emergency financial support to military and their families. So let me hear from you! Call me at (410) 683-1500 and I will answer all your questions.